State records show AFSCME has funneled at least $1.4 million to Michael Madigan and Madigan-controlled committees in the past five years – including at least $823,200 just this year. The American Federation of State, County and Municipal Employees Council 31 has directed over $1.4 million to Illinois House Speaker Michael Madigan and Madigan-controlled committees in the past five years – at the expense of union members. According to the Illinois State Board of Elections, AFSCME Council 31 and its political action committee funneled at least $1,434,200 between Jan. 1, 2014, and Nov. 5, 2018, to the Democratic Party of Illinois, the Democratic Majority and the Friends of Michael J. Madigan, the longtime speaker’s election committee. 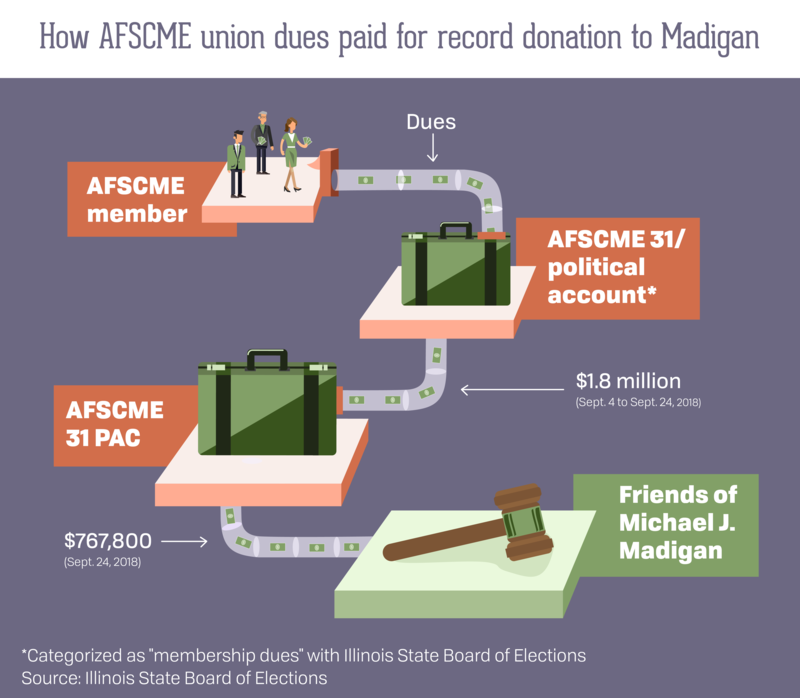 And records show union dues went directly to AFSCME’s contributions to Madigan. AFSCME Council 31 is the largest of the Illinois state workers’ unions. Just look at AFSCME’s activity in September 2018. AFSCME Council 31’s political account – which is subcategorized as “membership dues” with the state board of elections – first transferred over $1.8 million to its PAC between Sept. 4 and Sept. 24. Then the PAC transferred $767,800 to Madigan’s election committee on Sept. 24. That money will, in turn, be funneled to various Illinois House of Representatives candidates across the state. This sort of political spending is business as usual for AFSCME. The PAC spent over $6.8 million between 2013 and 2017 on Illinois politics, according to records with the Illinois State Board of Elections. As a chairman of multiple organizations, Mike Madigan was the top recipient of AFSCME’s political funding between 2013 and 2017. Between his campaign committee (Friends of Michael J. Madigan), the Democratic Party of Illinois (which Madigan chairs) and Democratic Majority (which Madigan also chairs), the speaker took in over $541,000 from Council 31 during that time. Of course, this total does not include funds Council 31 sent directly to other Democratic lawmakers backed by the speaker. Filings also reveal that between 2013 and 2017, the PAC directed over $2.78 million to the election committees of lawmakers currently sitting in the General Assembly. The majority of that spending – almost $2.7 million (96 percent) – was directed toward the election committees of Democrats. Filings show Republican election committees received only $101,000 during the same time period. But its members may not agree with what that voice is saying – or with just how much of their money the union is using to be that voice. AFSCME members upset by the union’s political spending do have recourse. They can stop their hard-earned money from being funneled to Madigan and his allies by resigning from the union and telling their employers to stop deducting dues from their paychecks. For more information about opting out of paying money to the union, AFSCME members can visit leaveafscme.com.